Implementing IT (information technology) systems such as ERP (enterprise resource planning) requires huge investments. Measuring the impact of these investments on productivity and profitability is extremely important for business managers. Many studies have failed to show the direct relationship between IT investments, organizational productivity and profitability, a phenomenon known as productivity paradox. The failure might relate to problems with the measurement techniques. This paper describes a measurement model, known as the PPP model (“Profitability = Productivity + Price Recovery”), that can fill the gap and show a link between IT investments, productivity, and profitability. The spreadsheet-based implementation of the PPP model, using multi-period data, generates performance trend charts of productivity, price recovery, and profitability. These performance charts provide a multi-period perspective to managers in identifying and understanding the impact of IT investments. This model is useful to managers considering heavy investments in IT as well as for managers interested in assessing their organizational performance and taking corrective actions in a timely manner. Worldwide IT (information technology) spending totaled $3.4 trillion in 2010 and is forecast to total $3.6 trillion in 2011, according to the latest outlook by Gartner, Inc (2011). “As the global economy continues to recover from the residual impact of downturn and recession, IT providers and users are facing increased pressure from unexpected sources,” said Gartner research team. They warned that the “Business leaders are demanding greater visibility of the linkage between IT investments and business results” (Plummer & Gammage, 2010). There has been a tremendous growth in the implementation of ERP (enterprise resource planning) systems in the last decade. It started with the large corporations and the trend is continuing with the small- and medium-sized enterprises (Argyropoulou et al., 2008, 2009; Equey & Fragnière, 2008; Rao & Mandal, 2007). The scope of these systems is also expanding. 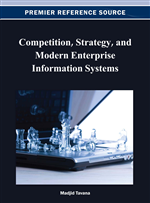 It started with intra-enterprise integration and expanded to inter-enterprise integration, with greater emphasis on things like supply chain management and customer relationship management (McGaughey & Gunasekaran, 2007). These systems require huge investments, and there are cases of huge failures (Dawson & Owens, 2008; Hanafizadeh et al., 2010; Muscatello & Chen, 2008). There have been several studies as to how to improve the implementation of these systems, including the use of critical success factors (Dawson & Owens, 2008; Hanafizadeh et al., 2010; Sankar, 2010). Two of the important factors are a large resource commitment to the project and the top management support (Sankar, 2010). The top management, of course, cannot support a project if they are not sure of its success. The general belief is that IT improves employee productivity, but the improvement in employee productivity has not always resulted in improving the company bottom line. In fact, several IT productivity papers found no significant positive contribution of IT to the overall productivity of firms, industries, or economies (Brynjolfsson 1993). However, researchers overwhelmingly agree to IT investments as a necessity for productivity improvement and survival in today’s competitive business climate. IT effects seem to have the following characteristics. First, IT effects are either directly (e.g., operational efficiency) or indirectly (e.g., increased market share) observable. Second, IT effects may be financial (e.g., sales revenues) or non-financial (e.g., improved customer satisfaction). Many non-financial effects are typically at a process-level, and may eventually translate into financial effect at the process or firm level. Third, IT impact on the firm may be temporal (lagged or immediate). Note that the above characteristics are related. For instance, several financial effects of IT (e.g., higher profits, higher market value) are observable only indirectly, and through lagged effects. Ironically, many productivity measurement studies have failed to incorporate the above-mentioned characteristics of IT. The measurement failure might have been exacerbated due to problems with the existing IT productivity measurement techniques. Those researches do not provide feedback to firm level decision-making so that managers can gauge IT performance at their firms, and plan for future investments based on results. This paper describes a measurement model, known as the PPP model (“Profitability = Productivity + Price Recovery”), that can fill the gap and show a link between IT investments, productivity and profitability.